System dynamics modeling is one of the main innovations of our project in the Democratic Republic of the Congo. With our partners, we are working to improve resilience of people affected by repeated displacement. The project also includes original field research and eventually pilot projects. We are building models to understand all the ways multiple displacement affects communities so that humanitarian and development interventions can make a greater impact. Models serve several purposes within the project, but we have already seen some surprising value added. 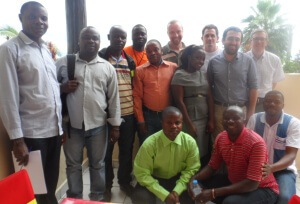 We demonstrated our most recent model iteration at a data analysis workshop in Goma, North Kivu, DRC. The audience was the Congolese staff that had been collecting data in two territories. Our purpose was simply to explain how their data would be used, but we could not believe the reaction we got. Simple insights, like the trade-off between short-term consumption and long-term investment, really resonated with these people who had delivered aid, many of whom had been displaced themselves. Some were excited to use the model as a tool to train their own teams. This sense of engagement set a positive tone for the rest of the workshop. The workshop yielded terrific system information. The research team could tell us when counteracting effects were in or out of balance, for example social tension and cohesion. When we talked about the environment, without prompting or probing, the first comment was (in translation) “it’s like a circle – low yield makes people use the land more intensely, which degrades the soil and makes even lower yield.” Another person submitted “It used to be that planting trees to replace the ones you cut down was important…Now the population is so high that trees are cut down so fast – planting new ones, they do not grow fast enough.” They moved their hands through the air to show better before worse behavior. They had opinions on time scale. Feedback loops, stock and flow thinking, dynamic behavior linked to causal structure: this is much more thoughtful, nuanced, and dynamically rich information than one usually gets from a typical client. It was encouraging to see the value of our tools; it is even better to work with great partners. “Increasing Resilience of People Affected by Multiple Displacement” is a project is funded by a grant from the UK Department for International Development. The consortium for the project is made up of the Norwegian Refugee Council, International Alert, the Internal Displacement Monitoring Center, and Climate Interactive.